GLAMIS Off Road Styled Wheels by Black Rhino. The GLAMIS is a sturdy eight spoke style. The Glamis takes its name from the renowned Glamis dunes in Southern California, a local get-away for all things off-road. Much like the dunes the GLAMIS wheel exudes prowess and style. Each spoke jumps out to a healthy lip accented by heavy duty stainless steel hex bolts. 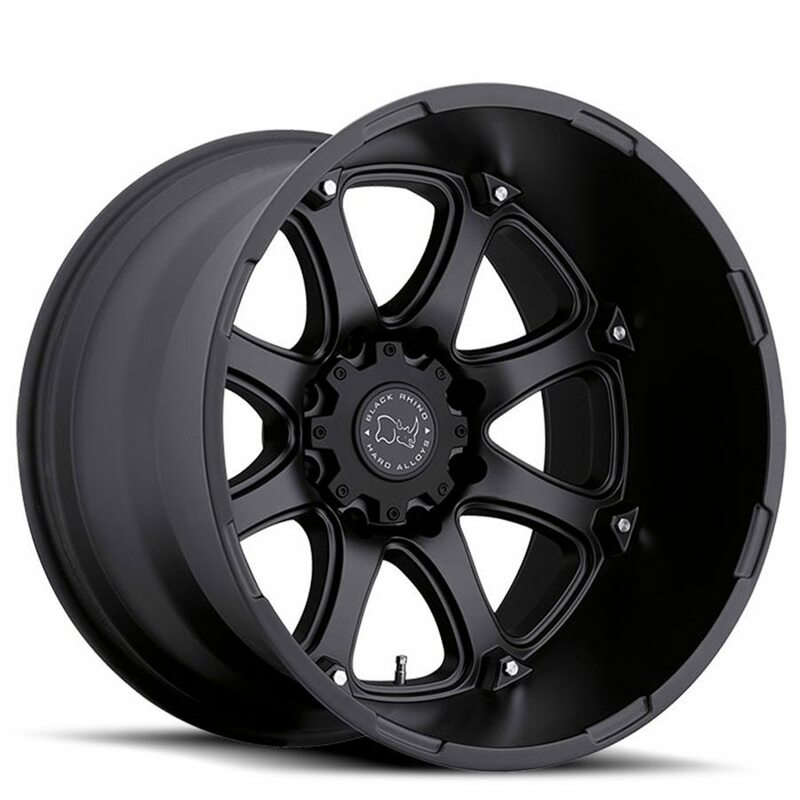 For those looking to truly stand out from the crowd, the GLAMIS is built in an incredible 20×12 with a 5” lip, and a 22×14 with an outstanding 7” lip in select bolt patterns. The GLAMIS is also available in aggressive standard fitments as well such as 17×9”,18×9”,20×9”, with offsets ranging from +12mm, 00mm, -12mm. There are a variety of fitments available in 5×127, 5×139.7, 5×150, 6×135, 6×139.7, 8×165, 8×170. The GLAMIS is available in a Solid Matte Black. Each Black Rhino wheel is engineered to carry the heavy loads often associated with Trucks and SUV’s. All wheels are either hub-centric or supplied with centering rings to ensure a smooth vibration free ride. GLAMIS off road wheels by Black Rhino.